Satisfy your urge: Come to Italy! Learn to paint more loose and free with international artist and television host , Karrie Evenson. Toss your fears and worries of painting aside and learn to be more brave and bold in your approach to creating art, as she helps you to step outside your comfort zone, allowing you to express your inner creative self. All skill levels welcome- especially beginners! Do you paint with small brushes? Tiny bits of paint? Would you like to loosen up and learn how to be freer with your approach to creating? 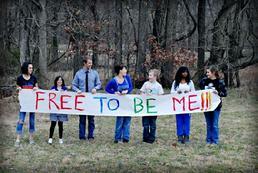 Self-expression is something we all yearn for as human beings, but what stops us? Fear of being judged? Fear of being wrong? Fear of it not being perfect? In my workshop, you can toss all those fears and worries aside! I will give you the tools and techniques to be more brave and bold in your approach to creating art, by helping you to step outside your comfort zone and allowing you to express your inner creative self. the joy of painting in a relaxed and inspiring atmosphere with the expert instruction of a nationally know artist and instructor and the camaraderie of a small group of learners. Group Meal Plan...$2949.00 per person! 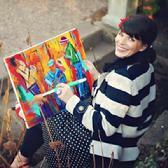 Karrie Evenson is an international selling artist and instructor . 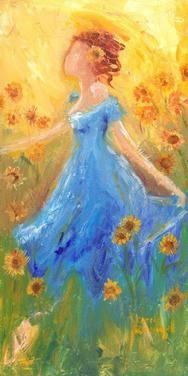 She is known for her bright, bold colors and loose, free style of painting. While she primarily works with acrylic paints, she also enjoys using mixed mediums to create texture and interest to her work. As an emotional painter, Karrie uses everyday experiences to tell a story with paint, brush and canvas. It is her hope to draw the viewer in and allow them to walk away with a sense of connection to her art. �The only way to paint is by being true to who I am, emotionally and passionately, this allows me to be more free and to let go�. Self-Expression- What does it mean? Do you spend hours on one painting or find yourself stuck on a particular piece? I will teach you how to begin a painting with basic warm-ups and starting out simple that will help unlock the creative animal in you! Want to learn how to step outside your comfort zone? Think outside the box? You will learn how to create expressive pieces that will be sure to entertain your imagination! Be brave, be bold �learn the power of color!! Ever wanted to use more color but you were unsure of how it would turn out? I will teach you the foundation you need to build a masterpiece using bold colors that are expressive and will engage your viewer. You will also learn how to use texture and why texture can really change the way you create and play with art. Get ready to paint boldly, and without fear as you join me in Italy. We will use our sketch pads and charcoal to sketch the beautiful scenic treasures of Italy and then head back to the studio for some loose and free painting, where we will practice the techniques of color, form, and brushstrokes as well as using our emotions to make a statement. Our days will be filled with artistic adventure, laughter and excitement! What more could you ask for as an artist? Every trip to Italy is unique. Come create your own Italian Odyssey. -7:30p Welcome to Cortona wine and chocolate tasting at La Saletta. -Morning Check-out and departure from Cortona or we can help you plan an extended stay! You may also bring any other colors you like, but please be sure to bring these particular hues, or close too. Travel with fellow artists, family & friends! that other workshops are offered this same week! Enjoy the experience together while immersed in different topics!